Google has made a big change in its search results that will have a major impact on Google users, search engine optimization (SEO), and social media. With the explosive growth of social networking, Google has been developing ways to combine social and search. A while back, Google started to include social results at the bottom of the search results with links to related content your social network “friends” had posted. Now, Google has changed it so content that has been shared by your friends and people you follow appear right in the search results themselves. As you can see from the screen capture below, Google is returning results from social network friends. These results have an extra line at the bottom of their listing saying who shared the page. (Example: the last listing has “Greg Atkinson shared this”.) The idea is that when a friend shares a page it’s like an endorsement of that page from a friend. Since in the real world we tend to give more credence to recommendations from our friends, Google is giving more weight (better position in the search results) to pages that have been shared by our friends. In order to have these social listings in your Google results, you must be logged into your Google account and you must connect your social networking accounts to Google. Because everyone has different friends and different people that they follow, everyone’s results will be different. If you do the same search as in the example screenshot above, you would get different results than we did. This adds a new reason for social marketing for your organization. You can get your content into the top results of the people who are following you. When other people share the link as well, then you are getting into their followers results. So, the larger your social circle, the more people will see your content. This also increases the importance of creating great content and optimizing that content (at least the title and post) for your desired keywords (search terms). The better the content you create and share, the more likely people are to share that content with their followers. At the same time, if you want your content to show up in the search results for certain keywords, then you need to include those keywords in your content, probably in your title (if it’s a blog post), and have the keyword in tweet or share text. So, how does this effect search engine optimization (SEO)? On the one hand, it will change the results people see when they do searches. There are additional listings in the search results and they do push some of the former top ten results out of the top ten. That said, the base results are still the same. Google is still starting with the same rankings and then they add the social listings into that list. So, it’s still important to optimize for your targeted keywords if you want to be in the top search results. Also, since a person has to be logged into Google and have connected their social networking accounts to Google to see these social results, there will still be a lot of people who are seeing the regular search results without social listings. With social networking continuing to grow, I’m sure Google, Bing and other search engines will continue to look for more ways to incorporate social networking into their search results. If you already have social accounts for your organization and have your staff sharing a tweeting, then you’re on the right track. If you don’t have social accounts for your organization or you aren’t very active with those accounts, I’d encourage you to take some time to develop a social networking strategy and start engaging your members and customers socially. It’s good for your organization and now it’s good for your search results. Would you help us with a little experiment? 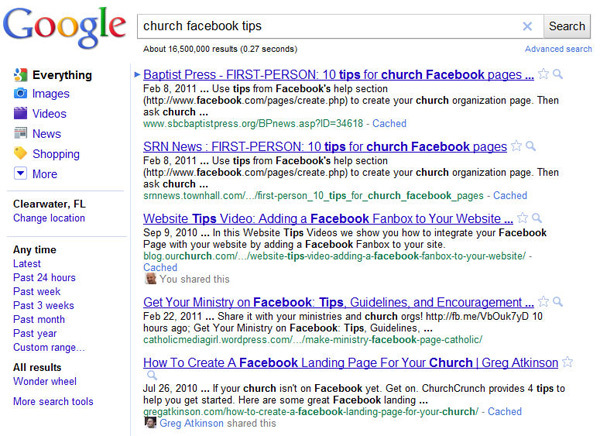 Would you Google “church Facebook tips” and tell us how the search results you see compare to the screenshot above? Please also tell us if you’re logged in, and if you’ve connected your Google account to any of your social media accounts. Thanks! Are you seeing social results in any other Google search results? If your organization isn’t using social networking, does this news make you more likely to start? Kurt, thanks for writing this post. I agree that this is big news. I'm very interested to find out how many people are seeing social results in their search results. My results are pretty similar actually. Thanks for posting your search results. They're similar, but notice how the ourchurch.com and gregatkinson.com blog posts are in our search results but not yours? That's because of the extra weight Google gave to those posts because it knows it was shared by people we're connected to through Twitter. This is very interesting. I don't see the social results when I search yet. I imagine it's just rolling out. And I'm friends with Greg so I theoretically should see the same results as above, but nothing yet. Here is what I saw: http://screencast.com/t/rV3ughdZ I did notice the "more from facebook.com" dropdown and that was interesting. Categorized 5-6 post on the top from FB. Scott, thanks for posting the screenshot. If you go into your Google account settings, edit profile – http://www.google.com/profiles/me/editprofile?hl=… – in the "My Links" section of the page, do you have a link to your Twitter profile? Regarding the new feature — the variability is interesting. Of course conceptually, this makes sense, but as soon as the SEO's of the world start to figure out trends in terms of algorithm weighting based on types of content/sites, seems like you could really skew results for long tail audiences. Kenny, thanks for posting the screenshot. Looks like you're not seeing the social elements in your results for this search. I'll ask you the same thing I asked Scott…. If you go into your Google account settings, edit profile – http://www.google.com/profiles/me/editprofile?hl=…. – in the "My Links" section of the page, do you have a link to your Twitter profile? Feb 9, 2011 … Take this quiz: — If your church could make free public announcements to thousands of your own members' friends, would you do it? Thanks Dale. It's a little tricky to tell from the text, but it looks like you have no social media results in the top 10, right? Nothing saying "[someone] share this"? I was more than happy to search out this web-site.I needed to thanks on your time for this excellent read!! I undoubtedly having fun with every little little bit of it and I’ve you bookmarked to take a look at new stuff you weblog post.